Immunoprecipitation of COS-7 cell extracts, untransfected or transfected with a construct overexpressing TrCP1-GST using GST (26H1) Mouse mAb #2624. Extracts were incubated with either Anti-Mouse IgG (H+L), F(ab')2 Fragment (Sepharose® Bead Conjugate) (lane 1 and 2) or Protein G Beads (lane 3). 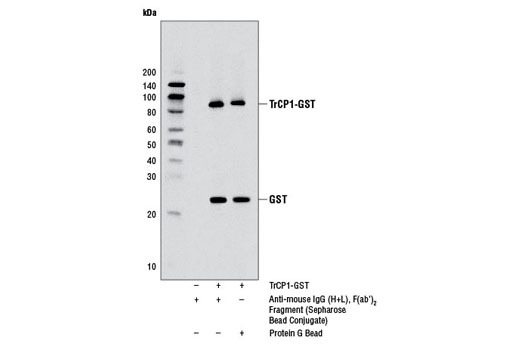 The western blot was probed using GST (91G1) Rabbit mAb #2625. Immunoprecipitation of NIH/3T3 cell extracts using Akt (pan)(40D4) Mouse mAb #2920. Extracts were incubated with either Anti-Mouse IgG (H+L), F(ab')2 Fragment (Sepharose® Bead Conjugate) (lane 1) or Protein G Beads (lane 2). The western blot was probed using Akt (pan) (C67E7) Rabbit mAb #4691. This Cell Signaling Technology antibody is immobilized via covalent binding of primary amino groups to N-hydroxysuccinimide (NHS)-activated sepharose beads. 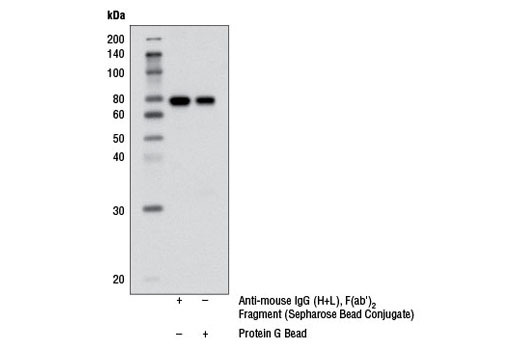 Anti-mouse IgG (H+L), F(ab')2 Fragment (Sepharose Bead Conjugate) is useful for the immunoprecipitation of antibodies raised in mice. Assay by immunoelectrophoresis resulted in a single precipitin arc against anti-goat serum, mouse IgG and mouse serum. No reaction was observed against anti-pepsin, anti-goat IgG Fc, or human serum proteins. The Anti-mouse IgG (H+L), F(ab')2 Fragment is produced by immunizing goats with mouse IgG whole molecules. The Anti-mouse IgG (H+L), F(ab')2 Fragment is prepared from monospecific antiserum by immunoaffinity chromatography using mouse IgG coupled to agarose beads followed by solid phase adsorption to remove any unwanted reactivities, pepsin digestion, and chromatographic separation. Anti-mouse IgG (H+L), F(ab')2 Fragment (Sepharose Bead Conjugate) is ideal for immunoprecipitation. This secondary antibody will detect mouse antibodies. Since this secondary antibody is made with F(ab')2 fragments, non-specific binding through Fc receptors present on cells will be eliminated.